Calling all cutting edge health enthusiasts, new age spiritual seekers, wellness centers, tanning salons and spas! The scheme of wellness is changing, expanding way beyond the four walls of fitness centers and yoga studios. Be the first to treat yourself, your friends or your clients to a one-stop shop for natural wellness. The Cocoon Wellness Pro Pod can take you back in time to benefit from ancient healing methods. The Cocoon Wellness Pro provides a range of services and settings including fitness, meditation and stress reducing programs. The Cocoon Wellness Pro Pod features six preset programs of natural technologies made with combinations of highly sophisticated components like dry heat, vibration massage, aromatherapy, salt treatment and jade stones. The Wellness Pro Pod is an automated system that uses a small amount of floor space, requires no complex installation, plumbing or configuration. The Wellness Pro Pod requires only an electrical outlet. Users lie down in the bed, adjust the features, and enjoy private wellness sessions that last from 20 to 120 minutes. 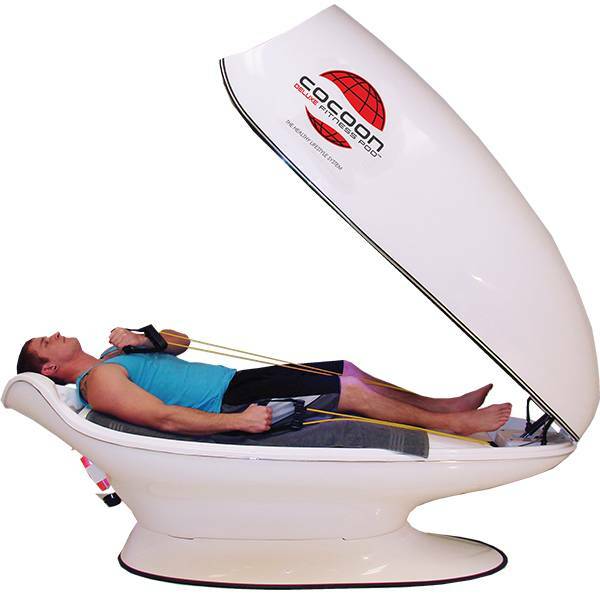 The Cocoon Wellness Pro requires almost no labor or maintenance to operate, and meets the huge need for ease and comfort for those seeking advanced bodywork therapies. Cut out the therapist middle man, and experience the limitless joys of true body care! The three levels of near, mid and far-infrared lighting work to deliver a dry heat treatment that can be set from ambient to 180-degrees Fahrenheit. The infrared lighting treatment is like stepping into a dry sauna. Exposure to dry heat accelerates heart rate, speeding the circulation of blood, typically doubling the flow of blood through the body. Exposure to dry heat speeds metabolism efficiently, allowing your body is to use calories consumed for energy instead of storing them as fat. Especially during fall and winter, joints become stiff and crack and pop and muscles tighten and ache. Through exposure to infrared heat, joints become more supple, muscles are relieved, and body flexibility increases. The sweat induced by dry heat exposure opens pores to release toxins and accept treatments. And, lastly, dry heat induces an undeniable relaxation with an enveloping, hugging heat: a perfect setting for meditation and release of the day's worries. MyCocoon delivers a full body vibrational massage therapy with a dual wave massage vibration system. Vibration is one of the five classical massage strokes that hails from ancient civilizations. Ancient Chinese medicine masters used vibration to raise the level of life force and stimulate or loosen muscles. Since the 16th century, Japanese schools of massage have used vibration to loosen rigid muscles and reduce rheumatic pain. Therapeutic vibrations exert a small, rhythmic force that travels deeply within the body cavity to exert small pressure waves on resistant muscles that feel tight. Gentle forces stretch the muscle until it reaches relaxation. The machine vibration employed by the McCocoon is even more effective than a massage therapist for this technique. Aromatherapy is the therapeutic use of essential oils. Everything in your kitchen and bathroom has an aroma, and each scent affects you. The smell of warm cookies, for example, may remind you of your mother's cooking and make you want to cozy up on the couch. Lavender bath mixes help muscles relax and the mind calm while you soak. You're using aromatherapy every time you cook, and you may not even realize it! Essential oils are highly concentrated essences of plants that are aromatic and therapeutic. Different scents may be employed for different purposes: protecting the life force, regulating digestion and metabolism, increasing resistance to disease and more. The most important pathway for aromatherapy is through the nose. The vapors of essential oils stimulate the olfactory nerve, which leads directly to the brain. Aromas, thus, have a great influence over mind and body, from calming to refreshing to cooling to stimulating. Aromatherapy delivered by MyCocoon also is absorbed into the bloodstream through the skin. The pure essential oils by MyCocoon will introduce you to four different scent therapies. For centuries, medical doctors from both ancient and modern civilizations have encouraged the use of Himalayan salt treatments to improve lung health and skin condition. When inhaled, Himalayan salt travels through sinuses and respiratory system to cleanse, absorb unhealthy moisture, remove mucus, and kill bacteria. Himalayan salt is an anti-inflammatory and anti-bacterial, and can fight upper respiratory conditions, seasonal allergies, sinusitis and bronchitis. Then, Himalayan salt therapy helps to lessen and even cure some common skin conditions and diseases, like eczema, psoriasis and acne. Salt therapy also reduces stress, as it produces negatives ions that boost the immune system and reduce chronic stress and fatigue. Jade is hailed as a healing stone by ancient and modern doctors, in cultures that stretch to the four corners of the world. Natural healers and spiritual leaders from East Asia and the Americas alike have come to the same conclusion about jade stones: they are powerful healers with heightened metaphysical properties of balance, peace, creativity, and physical improvement. Whether or not you subscribe to this belief system, the bed of 96 smooth jade stones provides a comfortable and therapeutic bed with a hugging shape and light, steady, massaging pressure. Max User Height 6' 5"